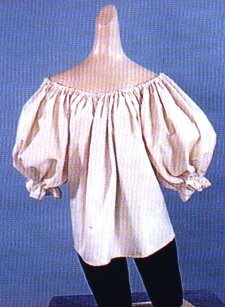 Lady's Blouse in a natural, unbleached muslin cloth. Gathered elastic neckline and full gathered sleeves. STD size fits most ladies size 8-14. A plus size version (18-22) is available for $10 extra.